THE SUPER VILLAIN! 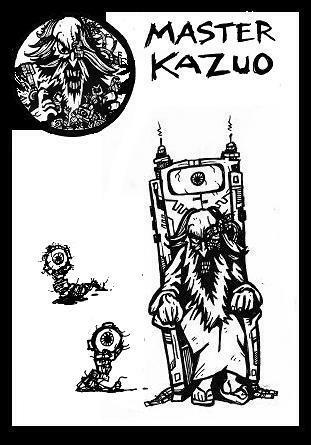 Master Kazuo, the Great HEAD GUARDIAN of the City of Gears, befell a terrible tragedy during what would have otherwise been his golden years. Although the captain had held his own against unspeakable adversaries defeating aliens, robots, monsters and madmen while defending the City of Gears. Due to retire to strategic duties the mighty warrior had begun preparing his descendants to take his place on the front lines. It was during these happy times that his ultimate undoing came in the most comfortable and unexpected of venues. While training his grandson and protégé, the elder was hideously injured as a result of the youths over zealous inexperience. Unaware of his own strength, the eight year old student accelerated his sword beyond normal capacity permanently injuring his grand father. The scar from the sword penetrated deeper than the skin damaging the elder in both body and mind. Physically Master Kazuo suffered only the loss of one eye, but mentally he degraded into abnormal behavioral patterns. In a matter of months following the injury the former leader’s personality had changed so much that even his closest colleagues could no longer recognize his presence. Kazuo became inapproachable and withdrawn before vanishing altogether. Shortly there after a strange breed of technologically corrupted tentacle monsters with giany eyeballs began terrorizing the downtown core. At first the creatures seemed to associate with small time Yakuza circles but as time passed their influence grew to international heights. The most unusual aspect of these savage gangsters was that these robotic atrocities seemed to act independently and far more intelligently than any of the known extraterrestrial technologies which have attacked the city in the past. This new sophistication suggested and indeed set about numerous rumors about devious mad scientist who is said to resemble the missing Kazuo. It has since become an urban myth that a one-eyed lunatic can been seen in the junk yards at dawn conducting sorcery around a pit of broken borgs and cybernetic eyes.